It may have been released in 1985, but 'Goonies' is a classic part of childhood for all kids. This is the perfect family night out as a last hoorah of summer. 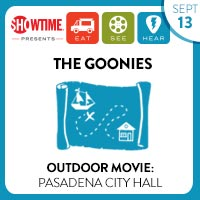 On Saturday, September 13, Eat|See|Hear will close its 2014 LA outdoor movies, music and food truck event series in Centennial Square in front of Pasadena City Hall. The evening will begin at 5:30 p.m. and will wrap with a showing of the 1985 cult classic “The Goonies” at 8:30 p.m. Tickets are available for purchase online through Eventbrite. Centennial Square is in front of Pasadena City Hall, located at 100 North Garfield Avenue in Pasadena, CA. There are multiple parking lots in the area and public transportation via the Metro Gold Line to Memorial Park Station. The only entrance to the event is on North Marengo Avenue at Holly Street. The finale event will include an assortment of LA food trucks on location throughout the evening including Jogasaki, Pie N Burger, Cousins Maine Lobster, India Jones, Romolo’s, Border Grill, Son of a Bun, Hungry Nomad, Rushed Art, Coolhaus and Brasil Kiss. Live music will be from local band The Janks. There will be street closures blocking off a seating area in Centennial Square. Eat|See|Hear recommends that attendees bring low beach-style chairs or other comfortable seating such as pillows, cushions and extra blankets.